The Colorado Chamber consults with members to invest at an amount that works in their budget, while providing support consistent with their commitment to a pro-business Colorado. Details of membership levels are below. To become a member, please submit a membership application form, or contact Dave Tabor, Senior Vice President of Business Partnerships, DTabor @ COchamber.com (removing spaces). Pre-paid Silver Sponsorship of the Annual Meeting and Colorado Business Day. Smaller businesses are critically important in The Colorado Chamber advocacy, and starting at only $595, business owners can have a say in how government affects their business. One person per member company may participate in The Colorado Chamber Councils, receive The Colorado Chamber email updates including Capitol Reports and urgent notices, and receive invitations to exclusive programs including receptions with state and federal officials. 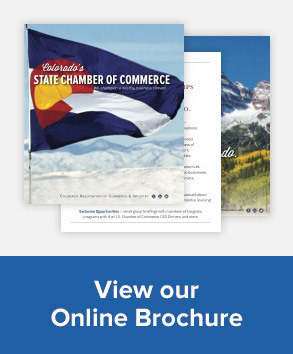 Support The Colorado Chamber, the State Chamber, as it supports your business! Trade associations play a special role at The Colorado Chamber. Their leaders bring tremendous expertise to The Colorado Chamber coalitions formed to support broad-based business success. Membership as a Trade Association includes participation in the exclusive The Colorado Chamber Governmental Affairs Council – the most effective and powerful group of pro-business advocates representing Colorado statewide. The GA Council meets with state legislators, heads of regulatory agencies, and members of the Governor’s office. Chambers of Commerce across the state are members of The Colorado Chamber. We successfully partner with a two-way collaborative dialogue on issues important to business. Many local chambers use The Colorado Chamber-created advocacy information to keep their members informed and engaged on business issues. $195 for chambers with revenue below $250K.